I challenge our denial to education, our freedom of speech, and the fears we have of being rejected raped, abused, killed and much more as women in Papua New Guinea. The book confronts the issues, and searches for solution avenues through government and the laws of PNG. The book does not aim to degrade the men in PNG, but aims to educate, inform, and position them all as loving, respectable and honourable. Good luck with your book, Christina. Incidentally, on a quick online search, I noticed this quirky story in the Whangarei Leader (and a photo by Christina) about the day a fishing crew caught a wild pig at sea! Brian Raymond Peters, in the company of fellow journalists Gary James Cunningham, Malcolm Harvie Rennie, Gregory John Shackleton and Anthony John Stewart, collectively known as "the Balibo Five", died at Balibo in Timor-Leste on 16 October 1975 from wounds sustained when he was shot and/or stabbed deliberately, and not in the heat of battle, by members of the Indonesian Special Forces, including Christoforus da Silva and Captain Yunus Yosfiah on the orders of Captain Yosfiah, to prevent him for revelaing that Indonesian Special Forces had participated in the attack on Balibo. There is strong circumstantial evidence that those orders emanated from the Head of the Indonesian Special Forces, Major-General Benny Murdani to Colonel Kalbuadi, Special Forces Group Commander in Timor, and then to Captian Yosfiah. Coroner Pinch also recommended that a 'national industry-wide Safety Code of Practice for journalists' should be developed in partnership with Australia's media organisations. 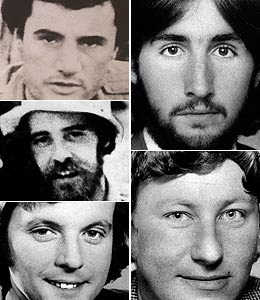 Pictured: The five who were murdered - Greg Shackleton (clockwise from top left), Tony Stewart, Greg Cunningham, Malcolm Rennie and Brian Peters. Joe Barratt, an AUT University graduate diploma in journalism student, topped the rangatahi/student award for print media in the annual NZ Media Peace Awards for a Scoop article revealing changes flagged by the draft anti-terrorism law amendment. The June report exposed aspects of the draft legislation before they had been widely reported in the mainstream media. The judges described the story as a “very timely and well-written” article which “delves into the relatively unknown bill” currently before Parliament. “It makes compelling reading, given that there has been very little public debate on the bill in question and the events of recent weeks,” they said. It's certainly timely that Joe should win this - on the very day that the Solicitor-General, Dr David Collins, canned the police hopes of bringing terrorism charges against the so-called Urewera 17. Among the many other prizes dished out for wide-ranging issues journalism at the NZ Peace Foundation function was a new Oxfam-sponsored Pacific Peace and Development Award - this went to independent television journalist Ingrid Leary for two "inspiring" docos about a suffering Samoan and a ni-Vanuatu woman who have become community advocates. Radio NZ's Don Wiseman was highly commended for an Insight programme on the Papua New Guinea elections. Among the three commended entries was the Pacific Radio News (Niu FM and 531pi) team of news editor Lito Vilisoni, Christine Gounder and Mema Maeli - for their coverage of the Fiji and Tonga political upheavals and reconciliation and also for Pacific Radio News coverage generally. Well done! Pictures: Liz March. Top: Joe Barratt; centre: Ingrid Leary with Oxfam's Barry Coates; above: Pacific Radio News team Christine Gounder, Lito Vilisoni and Mema Maeli. "The land issue is the legal, cultural and spiritual focus of almost all Maori grievances today. Many tribes, including mine, never even signed the treaty, so we just view our land as having been stolen. And above and beyond the Maori's spiritual relationship with their lands, you can make a very strong evidence-based argument for saying that the alienation of our land removed our whole economic base and distorted the whole range of social relationships. That's why this history is so important: for Maori, the injustices of the past have real implications for our present lives. We're still seeing their consequences. "There has been some attempt to address the land issue, but not with any tremendous success: the Waitangi Tribunal, established in 1975 to hear complaints of alleged treaty violations, has in the 32 years of its existence registered 1,400 cases, heard around 150, issued 50 reports - and settled barely 20 claims, for a total value of just over NZ$700m." Civil society campaigners in Fiji have scoffed at the allegations of a funded assassination plot against the regime's interim prime minister Voreqe Bainimarama. Both the Fiji Women's Crisis Centre coordinator Shamima Ali (pictured) and Pacific Centre for Public Integrity director Angie Heffernan rejected allegations on Radio New Zealand National's Morning Report today. Fiji police commissioner Elesa Teleni later announced three people has been charged with treason and conspiravy to commit murder. Many of the 16 detained people reportedly had links with George Speight who led the May 2000 coup. Both civil society groups have been strong critics of the post-coup regime. Ali told the Fiji Times that the FWCC acted constitutionally and denied being part of any assassination plot against members of the interim regime as well as senior members of the military. She said her movement was a human rights-based organisation and had no problems being questioned by police because all its activities were lawful. She added that all books were properly audited and there was no way any funding of an alleged assassination plot against Bainimarama and other members of his regime could happen. "Every financial transaction is recorded in our books and we welcome any check by anyone interested," she told the Fiji Times. Heffernan told Radio NZ the regime should come clean with any evidence it had. Until it did so, this was just an "alleged plot". 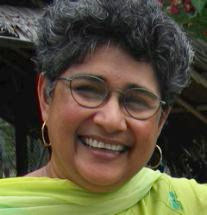 She also called for evidence of any plot in an interview with the Fiji Times, saying she believed it was also an attempt to divert attention from the military's failed attempts to have soldiers and police murder suspects in the Sakiusa Rabaka case leave the country under a United Nations mission to Iraq. Ali said nobody deserved to be beaten up when being questioning over a criminal allegation. Millionaire New Zealand citizen Ballu Khan was admitted at the Colonial War Memorial Hospital - and is under heavy guard - after injuries suffered while in military and police custody on Saturday night. He was denied access to a lawyer over the weekend. New Zealand Prime Minister Helen Clark has condemned the abuse of human rights. "In no case will I change course. Yes, at the end of January, after all the stages of consultation and democracy have been completed, the (French) Polynesians will be able to one again decide for themselves about their future and their own destiny", Estrosi said during speech during a function at the French High Commissioner's residence with over three thousand guests in attendance. Earlier this week, Estrosi addressed French Polynesia's legislative assembly in similar terms to justify his plans for electoral reforms and snap elections for the French Pacific territory. Meanwhile, French MPs in the National Assembly are to initiate the debate on Estrosi's Bills on November 22, French media reported on Thursday. The Bill is scheduled to be tabled for the first time before the French Senate (Upper House) on November 12 and before the French National Assembly (Lower House) by the end of November 2007. Since newly-elected French President Nicolas Sarkozy appointed him in June 2007, Estrosi has embraced a hands-on approach to address a perceived spate of ongoing political instability in French Polynesia, for the past three years, which has already seen six Presidents come and go during that period, all of them ousted through motions of no confidence.